This great rope soap is handmade using all natural ingredients including coconut oil which gives this roped soap a richness and creamier lather than most bath soaps for a more luxurious bathing experience. This soap features a designer-type fragrance that is similar to the extremely popular Polo Sport For Men. It captures the aroma of crisp oakmoss combined with rich sandalwood and musk and then topped by the clean notes of lemon, tangerine, pineapple, rosewood and ginger. If you are one of the millions of loyal fans of this superior fragrance, you won't be disappointed. 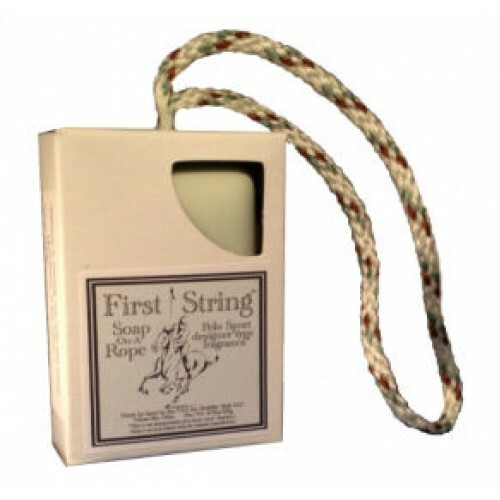 Since these rope soaps are handmade, supplies are limited. We occasionally run short during the holidays. If inventory is listed, order now. NOTE: *All designer fragrance "Types" are trademarked names and are the exclusive property of the manufacturer. The Polo Sport for Men brand is the property of Ralph Lauren and not associated with this product. The name is mentioned for comparison purposes only. Made by hand in the U.S.A.